Sonny Rollins walked into Ronnie Scott's office at the back of the club in Frith Street, London, carrying his saxophone case in one hand and a hold-all in the other. He opened the hold-all and emptied its contents on to Ronnie's desk. Ronnie's eyes widened as around 30 tenor sax mouthpieces, many of them no doubt rare and priceless, rolled onto the desk. 'I think you'll find something good here,' he told Scott, and selected one for the club owner to try on his own tenor. 'I'm always experimenting with mouthpieces,' Rollins added. 'Always looking for new sounds.' The search for a better tone - perhaps fuller in the low notes, with more accurate tuning in the higher register, or with that elusive, almost metallic quality saxophonists refer to as 'edge' - is the preoccupation many players, from students to international stars. In the course of a professional career, most saxophonists change the kind of mouthpiece they use several times, sometimes because of dental or muscle changes which affect the embouchure as they mature, but also in search of new tone qualities. Few musicians, however, carry around such a large collection as Rollins displayed on Scott's desk. Few have engaged in such a restless quest for perfection. He uses five mouthpieces regularly, he told me, but whichever he is using you can bet that he will still sound like Sonny Rollins. His tone has a glorious, monumental quality, as though hewn out of rock.Yet to view his music purely in terms of shaped sound, melodic expression or harmonic character would be to miss what is surely its most important element: the unsurpassed use of rhythm. 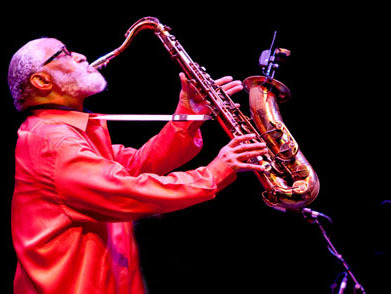 Sonny Rollins is a saxophonist, but at heart he is also a percussionist. 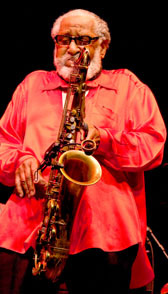 In Rollins' work, notes do not flow in a smooth cascade of sound, as they did in the work of saxophonists like Charlie Parker or John Coltrane, nor do they float from the instrument, as they did in the playing of Lester Young and Stan Getz. Instead, there is the slap of the drums in a Rollins phrase, whether he is playing tunes or solo improvisations. Fired by staccato attack from the tongue on the reed, the notes bounce in a joyous dance of intense creativity. In the context of his work, you can look on the saxophone as an elaborate tuned percussion instrument, its leather pads popping as his fingers smack them down on their tone holes like hands beating the skins of conga drums. It is this powerful individuality that makes Rollins an unassailable giant on the instrument, and he has remained a major figure in jazz for more than half a century. At the time of this interview during one of his seasons at Ronnie Scott's, Rollins was playing particularly strongly, blending swing, calypso and rock rhythms in vigorous performances, and sound as majestic as ever in ballads and contemporary songs. His percussive roots are in his family background, from his ancestors in the Virgin Islands. Rhythm is in his blood, but his career has been one long search for new musical stimuli, particularly, as he told me, a search for musical and spiritual understanding in visits to North Africa and the Far East. We talked about his music's rhythmic strengths, and the inspiration of his cultural background. Sonny was born in New York City, in 1929. His mother had come to the United States from the Virgin Islands, and he was exposed to the influence of the islands' music from an early age. 'My mother came from the islands, and I used to go to some of the dances they had,' Rollins told me. 'I got my mother to take me along, and that's where I listend to this stuff and got some of the influence. 'I love it, love to play it, and relate to it quite well; people seem to think so, and they kind of like some of the things I do in that vein. So I still do a lot of West Indian things, which is very similar, actually, to the African hi-life sort of thing. It's an African thing. West Indian music, for me, is close to African music . . . so I use it, I'm beginning to mesh that with some of the things we're doing [with his current band]. When he began his career as a musician Rollins was working in pure bebop style, recording first with singer Babs Gonzalves at the age of 18, and later with his idol, the modern jazz pioneer alto saxophonist Charlie Parker. 'I had begun piano lessons when I was eight years old,' he said. 'My parents started me at the piano, but it didn't take because I was more interested in playing out in the street with my friends, playing baseball, stickball and all those things. Then later on, when I was 12 years old, I became interested in the saxophone because I had some friends who also played the instrument. So I began to play the horn, the alto at first, and eventually I changed to the tenor because Coleman Hawkins was one of my big idols at that time. So finally I got the bigger horn. 'I convinced my mother to get me the tenor, and I began working with some young musicians, people of my own age, and eventually got heard. 'I was playing a job, which I never got paid for, opposite the Miles Davis group. I had a trio which was kind of an intermission thing. Guys like Miles, [trumpeter] Fats Navarro and [tenor saxophonist] Eddie Lockjaw Davis were working at the club, and Miles heard me and said 'OK, come to play with me'. I think prior to that I had played with the pianist Thelonious Monk and had rehearsed with Monk's band. 'Monk was one of my early teachers, someone that I respect a great deal, and I would like to give credit to him for helping me along and showing me the ropes in every way. 'As with most improvisers, his playing reflects both the conscious and subconscious assimilation of other musical cultures, but I was interested to know what actually goes through the head of a master jazz improviser while he is playing. He was living on New York's Lower East Side, and when he eventually picked up the saxophone again he would practise on the Williamsburg bridge to avoid annoying his neighbours. 'I would just go up there at any time and play, whenever I felt like it.' The break from playing at clubs and festivals lasted two years. 'It didn't amount to anything. Most of the time I was not doing anything, and when I finally decided to begin thinking about it, about things to do, then I began to have feelings about playing again, you know. 'So most of the time was spent in limbo, then I finally began to feel that I should be playing again. 'I don't feel that way, and I think that was a wrong assumption on their part. And so I think if the men are paid well, it's no problem. Everyone should get paid adequately, of course, and if there's any kind of communion between the players I think that every effort should be made to keep them together for the sake of the music. 'I do have strong feelings about bands staying together. Of course, it's difficult to get musicians to stay together now, but I can cite the example of Duke Ellington, who by having a constant group was able to have a large repertoire of very fine music, and I can cite the Modern Jazz Quartet, another group which stayed together. 'I can also cite John Coltrane's group which he had with McCoy Tyner, Jimmy Garrison and Elvin Jones. They were able to stay together for over five years, and this enabled them to hear the nuances of each other's playing and to get a bond. It really takes time. 'But Rollins adds that working with young musicians also renews creative drive. 'Most of the energy in the music comes from young musicians. A lot of the older musicians get jaded, so they get stuck in moulds, lose their enthusiasm for playing. Not everyone, but a lot of the people. 'There are guys that I began with, they either stopped playing interesting music or they are not working any more at all. So we always need young blood. If a young guy has ambition, spirit, vitality, energy - that's fine. 'Rollins has frequently experimented with musical form, and he can also take credit for developing revolutionary new sounds on his chosen instrument. He often wanders away from the microphone in search of reflections to shape the sound differently, pointing the bell of the saxophone at the ceilings in clubs, or playing close to the wings on the stage. He uses circular breathing (inhaling through the nose and keeping a reservoir of air in the cheeks) to play long lines of improvisation and to change the character of his tone. Rollins sums up his approach to music as a love affair with the instrument, a deep involvement which dates right back to the start of his career in jazz. He wanted to play the saxophone 'because it looked so beautiful. Such a lovely instrument when I saw it in the case, the lines and the shininess. I sort of fell in love with it. People who play the saxophone, if you question them enough about it, I think you'll find that there is a very personal thing involved. 'I remember at one time I had a horn I loved so much I would kiss it goodnight. And I thought it was weird until I asked some guys if they had ever kissed their saxophones, and they said yeah, they did! So I didn't feel it was such a strange thing! That horn, a Beuscher, it was just so easy to play. I still have it, but I don't use it much now because the sound is a little bit light. 'If there was a way I could make that horn heavier, so it would produce a heavier sound, then I would still play it. I've thought about getting it gold plated to see if it would add to the sound.